Decades-old conundrum solved by chance - Can one of nature's squiggly insects change the fate of the world? Plastic is not biodegradable, meaning it will stick around longer than we will. What if one of the world's more significant issues can be corrected with help from one of the smallest, seemingly insignificant of creatures? Are wax worms the answer to our plastic waste problem? LOS ANGELES, CA (Catholic Online) - The EPA estimates 75 percent of America's garbage is recyclable, but many only recycle 30 percent of it. Massachusetts alone generated 13.9 million tons of waste each year, with only 52 percent of it being recycled or diverted. Globally, the world uses up to 1 million new plastic bags a minute, costing 2.2 billion gallons of oil annually. Worldwatch Institute reported 4 to 5 trillion plastic bags, including large trash backs, thicker shopping bags and the thinner grocery bags, were produced globally in 2002. These bags are not usually recycled and end up in landfills, oceans and other environments, where animals are subject to deadly dangers. Some animals mistake the bags for food, others become fatally entangled. One plastic bag can take up to 1,000 years to break down, leaving several generations of animals at risk. Bans, taxes and other government policies have dramatically lowered the use of plastic bags but there are still trillions in the environment. European researchers discovered the common wax worm, the caterpillar larvae of wax moths, can eat the non-biodegradable plastic. According to National Geographic, Fedarica Bertocchini, a developmental biologist at the University of Cantabria in Spain, was in her backyard two years ago cleaning out bee hives. She removed some wax worms living in the hive and put them in an old plastic bag and got back to work on her hives. About an hour later, she grabbed the bag of wax worms and discovered small holes. Upon further inspection, she realized the wax worms, who are named for living on the wax of bee hives, were also able to sustain themselves on the plastic bag. Wax worms are able to eat plastic (CSIC Communications Department). When broken down, wax and the polyethylene in Bertocchini's plastic bag share a similar carbon backbone. She explained: "Since they eat wax, they may have evolved a molecule to break it down, and that molecule might also work on plastic." 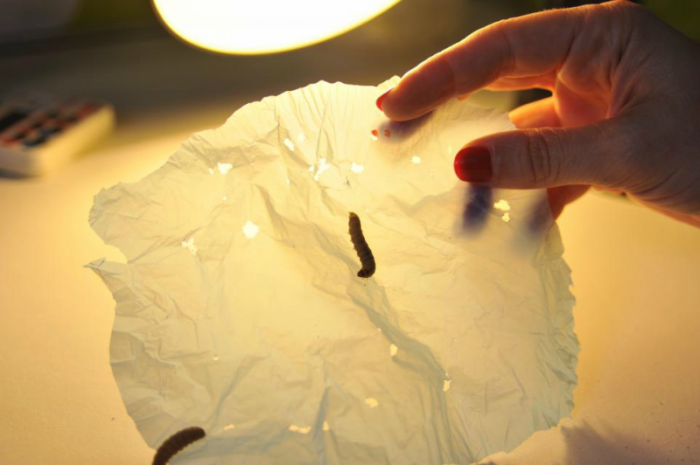 Bertocchini and fellow scientists Paolo Bombelli and Christopher Howe attempted several experiments to see how the wax worms were able to eat through the plastic without dying. They were placed on polyethylene plastic and were able to create 2.2 holes each hour. When left overnight, 100 wax worms degraded 92 mg of a plastic shopping bag, which indicated the same hundred worms would take nearly a month to break down the average 5.5g plastic bag. Though the results weren't as amazing as some would hope, it was a step in the right direction and encouraged the trio to continue their experiments. Several questions arose, such as how the worms were able to eat, if they were actually eating or simply breaking down the plastic, and what made it possible for the worms to ingest it. To rule out simple chewing, the team gathered recently deceased worms and placed them on a plastic bag. The larvae, which were deteriorating into liquid forms, ate through the plastic, suggesting an enzyme in the worms or bacteria living on and in their bodies was responsible for the dissolving plastic. When studied, they discovered the enzyme was able to convert polyethylene into ethylene glycol, a chemical commonly found in antifreeze. Scientists remain unsure which enzyme is responsible for the conversion but remain optimistic, as the discovery implies there is a way to biodegrade plastics. Bertocchini and Bombelli patented their discovery, with Dr. Bertocchini telling BBC: "We are planning to implement this finding into a viable way to get rid of plastic waste, working towards a solution to save our oceans, rivers, and all the environment from the unavoidable consequences of plastic accumulation. The study has been published to "Current Biology," where Bombelli writes: "If a single enzyme is responsible for this chemical process, its reproduction on a large scale using biotechnological methods should be achievable. This discovery could be an important tool for helping to get rid of polyethylene plastic waste accumulated in landfill sites and oceans." The research still has a ways to go, but the possibility of a natural way to quickly break down plastics can make a substantial change on the environment. Let's hope scientists can discover the methods soon.